Chevrolet has been trying to make sure that they introduce better technologies with the all new 2014 Chevrolet Corvette and therefore Chevrolet has now made an announcement that they are going to introduce the all new LT1 6.2 liter V8 engine which is SAE certified that can pump out 460 horsepower and 465 lb feet of torque with the available performance exhaust system. Chevrolet said that they would like to offer and introduce better engines for the consumers and this new engine is SAE certified that can be used with the same exhaust system. Chevrolet also said that the new engine will allow the 2014 Corvette Stingray to deliver 26 mpg and more on the highway making the car more fuel efficient than ever before. Jordan Lee Small Block Chief Engineer said that the 2014 Corvette Stingray LT1 engine is a symbol of advanced technology that offers more power and torque with more fuel economy which rarely happens. He said that the engine also combines well with the low mass of the vehicle and therefore it offers better RPMs and provides better vehicle acceleration and power than any other standard engine. He also said that the power and acceleration that this engine offers easily surpasses the performance of the rivals for sure. 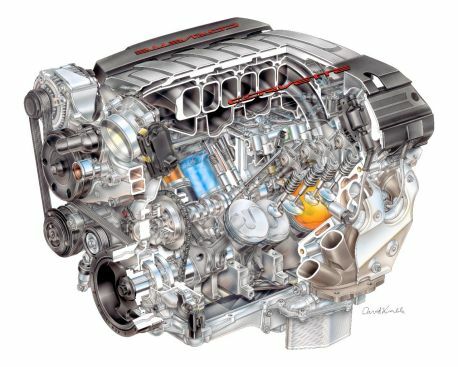 Chevrolet engineers said that at 74 horsepower per liter the engine has the capability to do much more than C6 Corvette LS3 6.2 liter V8 engine and also more than C6 Z06 racing derived 7.0 liter LS7 engine. Chevrolet engineers claim that the car will have the capability to accelerate from zero to 60 mph in less than four seconds considering the high output and performance of the LT1 engine that has been incorporated. The all new 2014 Corvette Stingray also incorporates Active Fuel Management and VVT technologies which support advanced combustion system in the vehicle.